When we go to New York, a Broadway show is a must, and it wasn't going to be any different this time just because we were bringing our kids with us. What would be different however, was how much it was going to cost us. I've sucked it up and paid full price for a Broadway show once (A Steady Rain), but having five of us needing tickets instead of two meant that not only did the material of the play have to be family friendly, but so did the cost. 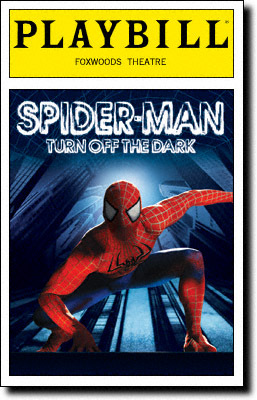 After searching through the discount options, we limited our choices down to Spider-man: Turn Off the Dark and How to Succeed in Business Without Really Trying. Spider-man would seem like the obvious choice, but How to Succeed in Business was starring Nick Jonas, which would appeal to my girls. Both shows had $79 orchestra seats available, and both were playing within a block or two of our hotel. So how did we decide? Lori made the decision, and if you know Lori at all, you know that she was choosing Spider-man. See, my wife has a thing for superheroes (Don't believe me? Take a look at the picture to the right.). This obsession sets the bar pretty high when it comes to competing for my wife's interest, and to be honest, Hollywood isn't exactly helping me out in this department. I'm waging a battle for my wife's adoration against Robert Downey Jr. (Iron Man), Ryan Reynolds (Green Lantern), and Christain Bale (Batman). Thank goodness Captain Jack Sparrow doesn't qualify as a superhero, or I'd be sunk. Faced with that kind of competition, it doesn't really matter what kind of shape I'm in. Walking around the house in my spandex yelling "I am Blogger Man!" just doesn't garner the same kind of respect. So with the decision made, I informed my kids that their first Broadway experience was going to be Spider-man. Actually, that's what I should have said, but I had to go and tell them that we were going to see "Spider-man: Turn Off the Dark". This led to me spending hours of my free time trying to explain how someone would "turn off the dark". On the other hand, I didn't fare any better trying to explain to my children, who were all born in this century, that the music for the play was written by Bono and Edge from U2. All that got me was a bunch of blank stares and "Who are they?" questions. I've never felt older in my life. What I should have done was told my kids that the music was by LMFAO. Then they would have been paying attention (I'm Spidey and I know it....Wiggle, Wiggle, Wiggle, Wiggle, Wiggle...). over the audience are fairly impressive (although if you've seen KA in Vegas you'll be underwhelmed), but everything else is fairly mundane. I was struck with a particular urge to nap every time the giant spider deity (Arachne?) was center-stage. Even the music was bland. It's a bad sign when the only song I can remember on my way out of the theater is the little snippet of U2's Beautiful Day that played when the Daily Bugle put the Green Goblin on hold. I got a laugh out of that, but there weren't anywhere near enough moments like that in the play. In fact, I found myself rooting for one of the famed technical problems that have plagued the show since it's beginning. At least it would have taken my focus off the inflatable bad guys. Seriously Spider-man? You spend $65 million on your play, yet the first guy that Spidey gets to fight is a giant blow up doll? I think I've made my case here. Now while I wasn't enamored with the play, I believe that I'm legally obligated (and if I'm not legally obligated then I'm definitely marriage-ly obligated) to tell you that Lori enjoyed the play a lot more than me. Even the kids seemed to enjoy it more than I did, which leads me to wonder if perhaps I missed something. Maybe Spider-man is aimed at a younger audience (I'm a few years older than Lori, as she's so fond of pointing out). Maybe things were going over my head (literally at times) that my wife and kids could find meaning in. Or maybe, and this is my deepest fear, my wife's infatuation with superheroes is hereditary. If it is, then I'm going to have to raise Blogger Man's game a little to keep my family's respect. Maybe I can find some inflatable readers. Anybody know how to make a blow up doll like you on Facebook?